Maybe you’ve already heard about the small German grocery chain where you can buy groceries for even less than you’d spend at Walmart. Aldi’s prices are super low — so low, in fact, you might not be sure what kind of quality you’re getting, to say nothing of customer service. I mean, you do have to pay to use its grocery carts. If you’ve never ventured inside your local Aldi, listen up: It’s time. We promise you’ll thank us later. And even if you’re already a brand fanatic, you might not know some of these great tips for saving even more money on Aldi groceries, or stretching your grocery budget a bit further. Aldi is set up like a warehouse. Employees stock shelves by keeping products in their bulk boxes, cutting down on time and reducing labor costs — which keeps product prices low for you. Instead of buying bags at the checkout line, use the empty boxes from the shelves or the front of the store — you’ll save a good chunk of change in the long run. If you are unsatisfied with a product you purchased, simply return it. Not only will Aldi refund you, the store will also replace the product! Double Guarantee? More like double win. There’s nothing like a quality piece of chocolate. Since Aldi has European origins, its chocolate is actually fantastic. The store carries quality name brands such as Ritter Sport and Choceur, meaning you don’t have to compromise your sweet tooth for some savings. Yum! Fun fact: Aldi was originally part of the same family enterprise as Trader Joe’s. Both companies are well-known for having the lowest of the low when it comes to prices. While we do love the Joe, it’s hard to ignore that sometimes Aldi may be even more affordable. Compare the weekly newsletters before deciding which one to head to that week. Some people may be turned off by not being able to purchase their usual brand name products at Aldi — but they shouldn’t be. Did you know Aldi’s Millville brand is actually made by many of the nation’s leading food producers? Even better, all of these products are taste- and quality-tested to make sure that they meet (or exceed!) the quality of national name brand. So go ahead and skip the overpriced cereals and granola bars at big-name commercial grocery stores — you can buy nearly the same exact products at Aldi under a different name that costs you way less. Eating organic or gluten-free on a budget may seem impossible, but it doesn’t have to be: Aldi has an entire section dedicated to both types of products at its famously low prices. By sourcing locally, the store’s able to cut down on costs and you’re able to feel better about what you’re putting into your body. Not only can you find things like backpacks, kitchenware or showerheads, you can also find quality meats paired with veggies for quick and easy dinner meals. These featured items are listed weekly on Aldi’s website and also in stores, so be sure to check them out. Don’t blow your hard-earned holiday money at stores that kill your budget on name-brand toys, like Disney or Barbie. During the holidays, it’s not uncommon to find those same toys at Aldi stores for a lower cost. 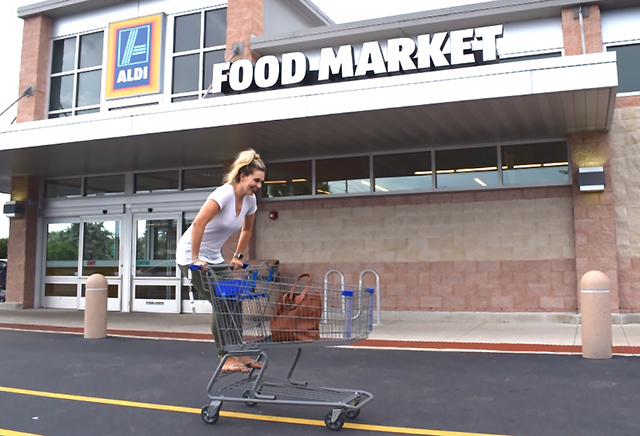 Your turn: What’s your favorite thing about shopping at Aldi? Tell us in the comments below! Kelly Smith is an editorial intern at The Penny Hoarder and a senior at The University of Tampa. She wishes there were an Aldi closer to her apartment.